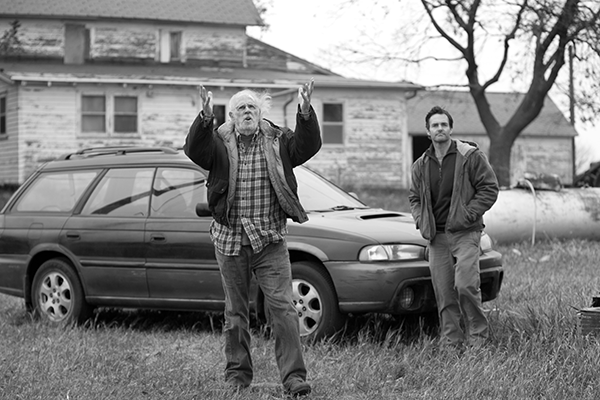 Following the exotic The Descendants, Nebraska is something of a return home for Alexander Payne. The winner of an Oscar in 2011, a member of the Nanni Moretti Jury last year, the director is once again in Competition eleven years after About Schmidt, this time to present a road movie with a comic twist. Destination: his native land. Time to hit the road! Woody Grant has won the jackpot: one million dollars in the lottery that must be collected in the plains of Nebraska. And so the alcoholic father leaves Montana with one of his sons, but the journey isn't exactly a peaceful one. As the miles pass, family and old acquaintances make their appearance and the father's past resufaces. The plains of Nebraska have always inspired Alexander Payne, starting with his first feature film, Citizen Ruth (1996), the story of a pregnant drug addict caught between a judge who is pushing her to abort and a pro-life group. They were also the location for About Schmidt, presented at Cannes in 2002 and marked by Jack Nicholson's performance, while his 1999 film Election was shot in Omaha, his native town. After The Descendants, Alexander Payne reconnects with the wide open spaces of Nebraska with which he is so familiar, but at the same time he unhesitatingly breaks away from his usual filming habits. The director, who "likes the power of actors" such as Jack Nicholson and George Clooney, has this time chosen to use amateur actors in the film's cast. He also put colour to one side to create the only black and white film in Competition. Thursday 23rd May / Grand Théâtre Lumière / 8.30 a.m. – 3.30 p.m. – 7. p.m.
Friday 24th May / Salle du Soixantième / 11.45 a.m.